Some of Wonderellas most popular articles are now available individually in the new Little Wonder Pamphlet Series. Little Wonder pamphlets are designed like single book signatures and are printed on 67 lb. Vellum Bristol paper. They are wonderful to hold and read and will appeal to antique and rare book collectors. Little Wonder pamphlets are available at the prices listed below. For ordering information, please visit the mail order page. Each Little Wonder pamphlet is printed in a special size of 6.5 x 4.25 inches. Click any of the cover images below for a closer look and a peek at a few inside pages. 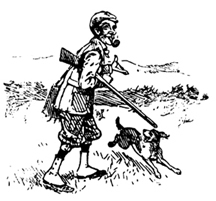 On Gnoming: Phooka editor Reginald Bakeley outlines the principles of hunting and cooking these small, malignant, and particularly tasty woodland creatures. A sidebar on defenses against trolls while gnoming is included. 12 pages, 2 illustrations. Goblinproofing Ones Chicken Coop: Another classic from Reginald Bakeley. In this essay, Reg spends some time at his Welsh farm making sure the henhouse is safe from goblins and their vile changeling eggs. The problem of goblin hens is explained and a few solutions (one including the local Freemason chapter) are offered. 12 pages, 2 illustrations. Lewis Carrolls Croquet Companion: Not only was Lewis Carroll a nonsensical storyteller, but he also penned a few variations on the garden game of croquet. Take this pocket guide to your next match and wow your friends! Features rules for Arithmetical Croquet and Croquet Castles for 4 or 5 players, as well as an introduction by Reginald Bakeley. 16 pages, 3 illustrations. Regarding Fairy Phlegm: Gordon Murphy is believed to have found the world’s first specimen of a bogie’s bogie. Percival Dwight interviews Murphy about his unique possession and summarizes the controversy surrounding it. 12 pages, 2 illustrations.